September 2012 – CREATE. PLAY. TRANSFORM. What does the beginning of the “ber” months say in The Philippines? Christmas is just around the corner! It’s only the month of October and our Christmas list gets longer through December. Most of us think of special things to give away. What could that special thing be? Is it something that costs so much and will eventually get old and rotten? What can be more special than something with a cool brand, or an affordable piece, yet its quality doesn’t last for a lifetime? HANDMADE THINGS. Who will make them? You will! Potter’s wheels are turning, raw pieces of clay are kneaded on the table, slabs of clay are transformed into functional pieces, bisque fired pots are dipped into buckets with glaze, and the kiln is all fiery too! Join the fun at Clay Ave and be proud of yourself for creating something out of nothing! Bring life to a lump of clay! 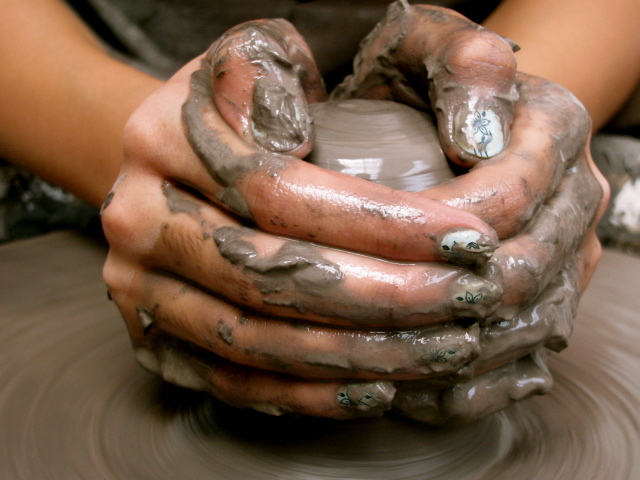 Put those electronic gadgets aside and sink those hands into wet clay! 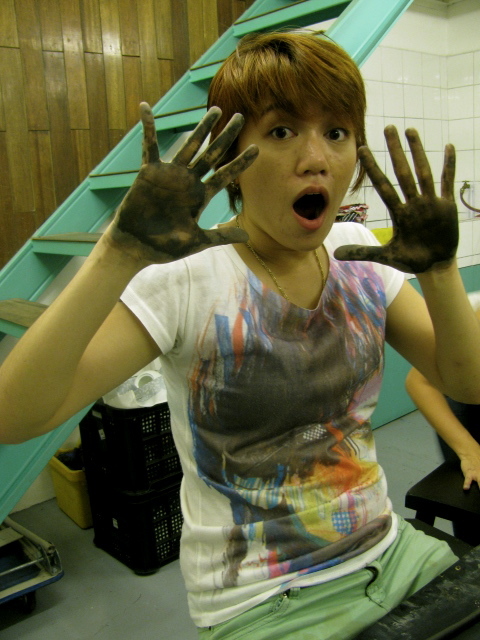 Get those hands dirty right at Clay Ave, where people from all ages and nationalities are welcome! 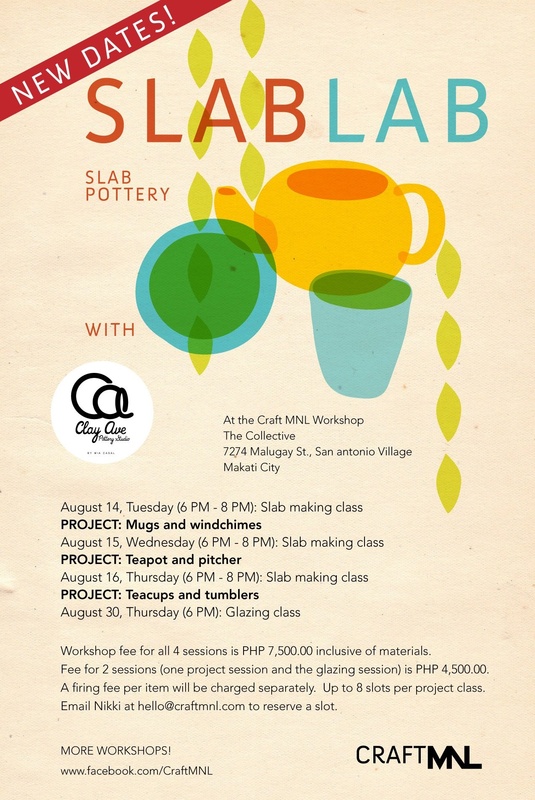 Clay Ave gives away a 5% discount each month for students who would like to reserve slots for pottery lessons in Manila. I am looking forward to meeting you at the mud pit in Quezon City! Clay Ave Goes To Craft MNL! In the heart of Makati City is a creative space called “The Collective.” It is a warehouse compound that holds artists, designers, and restaurants too. This year, Craft MNL opens at The Collective and they invite artists and crafters who can hold workshops in their space. I met Marielle and Lex of Craft MNL during an Arts and Crafts fair at 10a Alabama in Quezon City. Clay Ave got invited to hold some sessions with clay! 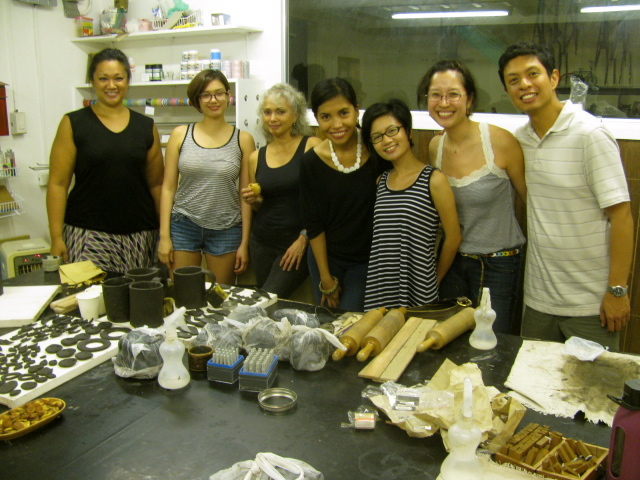 After working hours, some participants have decided to get their hands dirty with clay! I put all the rolling pins out and taught them how to create using the slab making technique. You see, making pottery is not just using the potter’s wheel! 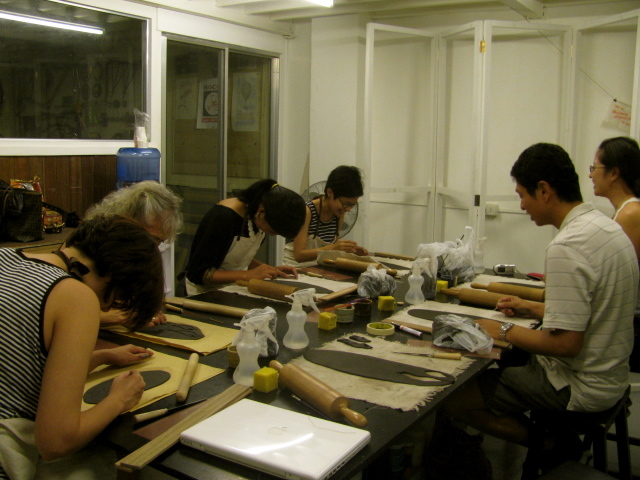 People can create a wide variety of pieces by simple making the clay flat. With a help of some cut-out templates, functional pieces are formed! They don’t mind getting their hands all dirty with clay! Glazing is always done on the last day. Pots are brought back to the studio after the second to the last session. I fire them in the kiln with a temperature of 900 degrees celsius. Pots are dunk right into the buckets filled with glazes. Brushes are taken out for those who want to paint on their pots. After the last session, I bring back the glazed pots with me to Clay Ave and I fire them to a higher temperature of 1260 degrees celsius. Before the session ends, we get hungry and we make sure that we eat something with clean hands of course : ) Thanks to the restaurant, “Kubyertos”, for making this sweet treat! I will keep coming back for more! A little bite of something sweet won’t hurt while glazing : ) Marielle makes sure that her hands are clean! Glazed pots will be delivered this Sunday to Craft MNL. Thank You for taking time in getting those hands of yours muddy for several evenings in August! I am looking forward to signing up for pottery sessions in 2013! 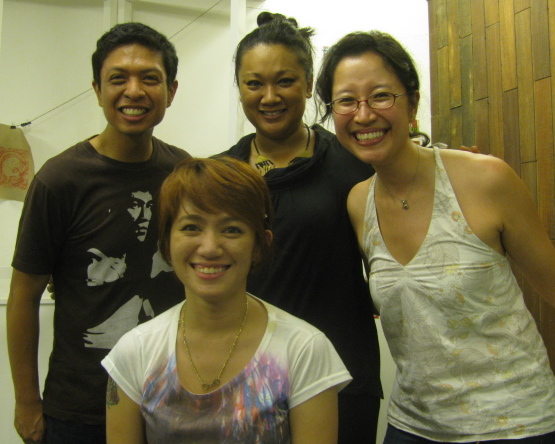 Thank You, Craft MNL team, for accommodating me in your creative space! 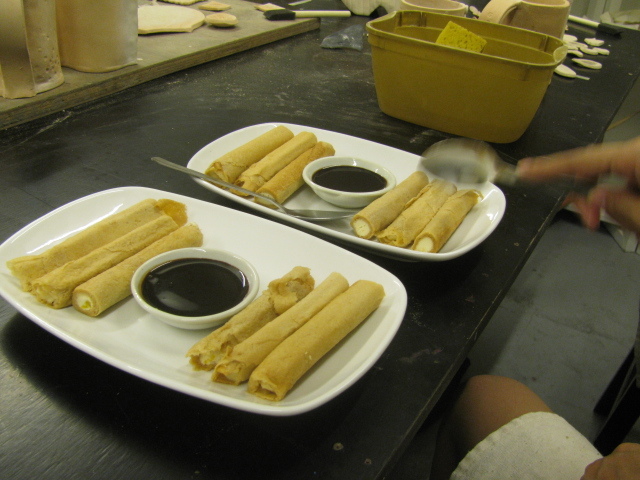 To know more about the workshops they offer, visit their website at http://craftmnl.com/. Get to know the crafters of Manila. Get those hands busy and start creating something! Spread the love for handmade creations. 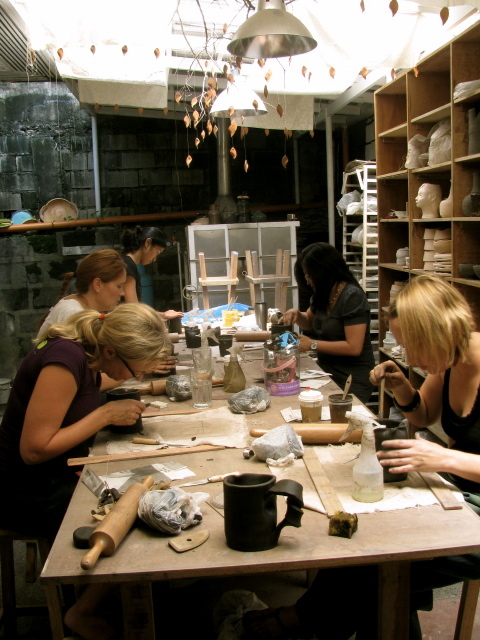 The Crafters are right here in Manila and some of them can just be within your neighborhood! 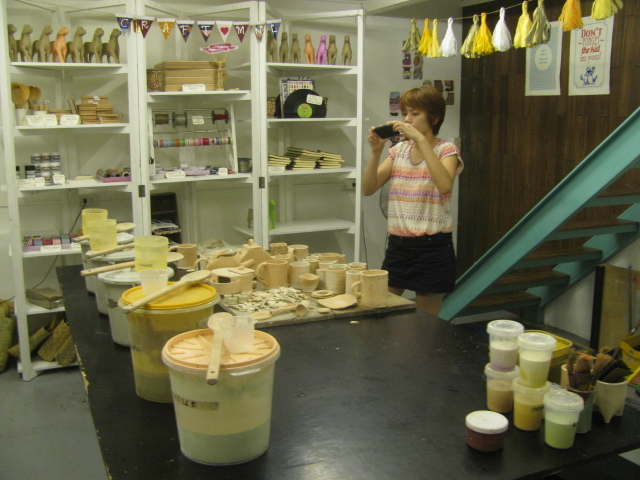 For private pottery lessons, send an e-mail to clay.ave@gmail.com and visit http://clayave.weebly.com for more details about your first muddy experience in Manila!